Memon was handed over to NAB on judicial remand until November 4. 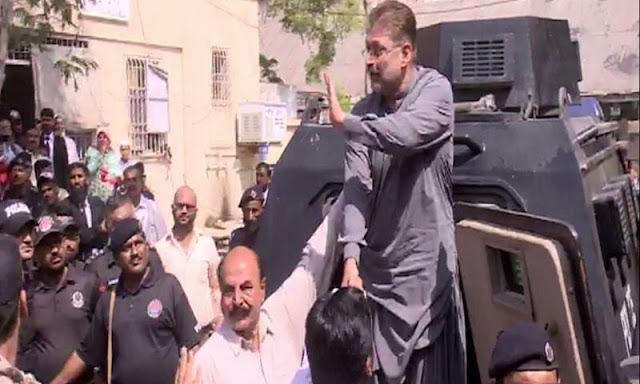 Former Sindh Information Minister Sharjeel Inam Memon, who was taken into custody by the National Accountability Bureau (NAB) on Monday, appeared before an accountability court on Tuesday amid tight security. A day earlier, the PPP leader had been taken into custody after the Sindh High Court rejected his bail plea in a corruption case pertaining to the award of advertisements at 'exorbitant rates' through the abuse of his power. Eleven others who were arrested in the same reference yesterday were also presented before the accountability court today and sent to jail on judicial remand until November 4. Out of the 11 co-accused, five had handed over themselves to NAB officials whereas the remaining seven had been arrested along with Memon. One accused in the case had been granted extension in his bail. The accused are alleged to have been involved in corruption worth Rs5.76 billion in the case. In a previous hearing of the case, NAB had said that it had investigated corruption and corrupt practices in the award of advertisements against the law and at exorbitant rates to TV channels and FM radio stations for various awareness campaigns between July 2013 and June 2015. It said it had found that the accused acted with the connivance of each other, resulting in losses to the national exchequer. Memon is also facing a separate reference regarding illegal adjustment and consolidation of hundreds of acres of land in favour of a private housing project. Following the rejection of his bail plea on Monday, Memon had holed up for hours in a courtroom to avoid arrest as his team explored their options, but could not stave off the inevitable for long. During this period, in an apparent show of solidarity, several PPP ministers visited Memon in the court, DawnNews had reported. To avoid any 'untoward incident', a large number of law enforcement agencies personnel had beefed up the security around the court. As soon as Memon had exited the building, surrounded in a tight cordon by his lawyers and supporters, he was nabbed by representatives of the accountability bureau and whisked away. Former Sindh Information Minister Sharjeel Inam Memon, who was taken into custody by the National Accountability Bureau (NAB) on Monday, appeared before an accountability court on Tuesday amid tight security. Memon was handed over to NAB on judicial remand until November 4.